Great fun for all! How far can you hit it? Take a swing and find out with Baseball Batting. Experience the thrill of hitting a home run, right here at Chancellor Park Golf Driving Range & Baseball Batting. Automated batting cages with speed adjustments makes this suit anyone, regardless of age or skill level. It really is a great practice facility for softball and baseball palyers who want to develop their batting skills to improve their game. Bring your favourite bat - or use one of ours. We provide helmets and gloves at no extra cost. Your safety is important to us at Chancellor Park Golf Driving Range and Baseball Batting. From the youngest member of the family to the seasoned player, everyone enjoys Baseball Batting! Our pitching machines speed is adjusted to suit all ages and abilities, so you can relax knowing that you will never feel under pressure to hit the big ones right from the beginning. 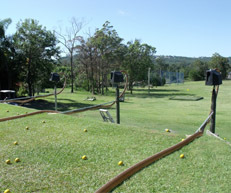 Bring the kids - they will have an awesome time and feel like 'one of the big boys' as they hit the baseball out into our 300+ metre range.